Why? Because it’s marine life-inspired (love! ), gorgeous…and cheap (in other words, jewelry that you can wear the beach without being sent into a spiral of despair if you lose it to the waves). Kendrick and I first stopped into Sadie Green’s when we visited Ogunquit two years ago, and as a little pre-wedding present he bought me a crystal-studded starfish necklace (the one I’m wearing in the above picture). I am not exaggerating when I say that rarely a day goes by that someone does not stop me to say that they love it. 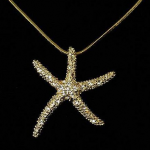 I wear so many necklaces that I always have to ask the complimenter which one they’re complimenting…but it’s always the same one: my starfish. It’s starting to look a little dilapidated, though (totally understandable for a $12, two-year-old necklace that I wear almost every day), so I was beyond excited to discover that the store still carries the exact same design (we replaced my old necklace with the sparkly, bright one I’m holding up there on the left). And the Even Better News? 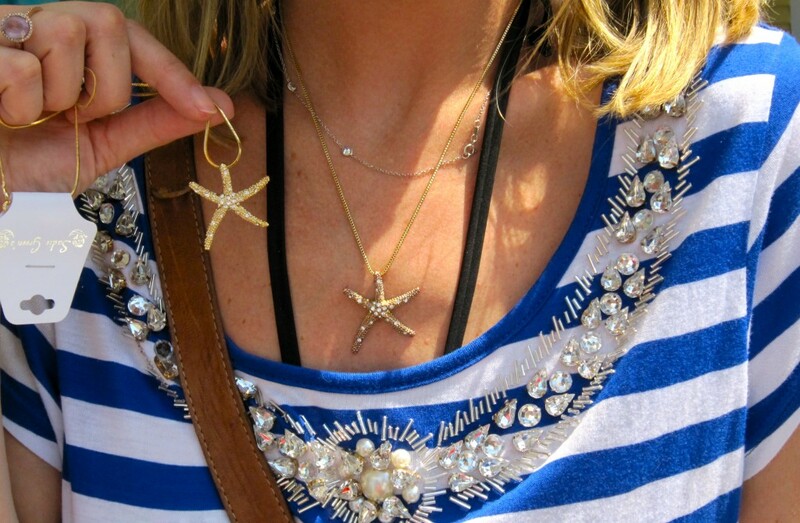 You can buy the necklace (and matching earrings, which I also purchased) online…so even though you really should take a trip up to Ogunquit this summer, you totally don’t have to.